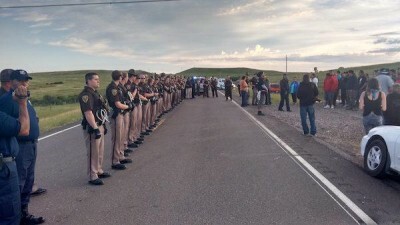 While Clark met with law enforcement, his fellow vets that accompanied him to the bridge formed a human shield to hold space and stand between the police and the water protectors. There are now unconfirmed reports within the camps that the use of live ammunition has been approved by law enforcement on anyone attempting to retake the bridge. Many on the ground believe that the National Guard may be called in, creating a potentially drastic escalation of an already tenuous situation. The video below reveals Sheriff Kirchmeier attempting to lay the groundwork for an escalation of police violence by spouting ridiculous assertions regarding vets and PTSD. Be aware that his diatribe almost certainly marks the beginning phase of an escalation of police-sponsored violence — which will ultimately be blamed on water protectors and veterans. The veterans have brought supplies such as gas masks, earplugs and body armor in an effort to form a protective line around protestors as a means of protecting them against rubber bullets and bean bag rounds – which are actually filled with lead pellets, not beans. One water protector, SiouxZ, has already gone blind in one eye after being shot in the face with these munitions. “Our goal is to stand there and if need be take the rounds for the First Nations people so they can do their thing,” Mark Sanderson, a former Army Sergeant who served in Iraq, told Vice News. In fact, the veterans are taking a page out of international protest movements by bringing mirrors to Standing Rock in an effort to make law enforcement officers look at what they have become – nothing more than a militarized security force for billion dollar energy corporations. “The veterans are saying we can’t stand for that,” filmmaker Josh Fox, who has documented the police force at Standing Rock, told RT. What you do to the water protectors you do to the United States Constitution. We are sworn to uphold and protect the United States Constitution against all enemies, foreign and domestic. And they’re saying listen, if you wanna burn the United States Constitution, you have to go through us. It’s quite a brave and amazing act that’s never happened in the history of the United States, that two thousand veterans just said you know what? Shoot at us first. The Army Corps of Engineers, last week, issued an evacuation order for all protest camps North of the Missouri River by Dec 4th – which includes the Oceti Sakowin camp – a demand that has been rejected wholesale by tribal leaders. Then, on Monday, North Dakota Governor Jack Dalrymple ordered a mandatory evacuation of the area, citing health concerns. The collusion between the feds and Dalrymple, to laughably use “health concerns” as a means of forcing the closure of the camps, means that anyone who refuses to leave by December 5 risks being arrested or fined on a state and/or federal level. The state has denied it has plans for the “forcible removal” of protesters, but given the ongoing brutality, and disparate force, evidenced by law enforcement — the state’s denial is of extremely little value. In addition, as we previously reported, the Morton County sheriff’s department has threatened anyone bringing supplies to Standing Rock with a $1,000 fine. As if brutalizing and beating non-violent protestors wasn’t enough, Kirchmeier’s goons now look to create a human rights crisis in the below freezing condition. For many of the veterans, including Sanderson, an Iraqi war vet, the battle over DAPL isn’t a simple environmental issue, as he believes that he is standing on the right side of history. While there is no guarantee against state-sponsored violence at the hands of law enforcement, the arrival of these selfless veterans may decrease the likelihood of the continuation of appalling violence that’s been displayed by law enforcement over the past few months at Standing Rock. Please share this amazing story to show the people of Standing Rock, and the veterans that have come out to support them, that the American people stand with Standing Rock!! *Update – In a complete reversal of the expected, early reports say the Army Corps of Engineers has now denied the easement which would allow Energy Transfer Partners to drill and route the Dakota Access Pipeline under the Missouri River. “The Department of the Army will not approve an easement that would allow the proposed Dakota Access Pipeline to cross under Lake Oahe in North Dakota, the Army’s Assistant Secretary for Civil Works announced today,” the Army’s Assistant Secretary for Civil Works, Jo-Ellen Darcy, stated.